Have you ever felt that birthday cake is over rated on birthday parties? I mean if kids birthday I can understand that having a cute cake with awesome theme is more important than the main meal itself, but when you are adult, sometime you just don't really feel like having a cake for your birthday (or in my case, I just don't feel like making one.. hihihihi..). It took me quite sometime to figure out what can replace birthday cake on a birthday event. I wanted it to be effortlessly awesome and I meant it literally. I was looking for something that is not too complicated yet it still awesome in taste and get people to ahh and oohh, appreciating the palatial experience. 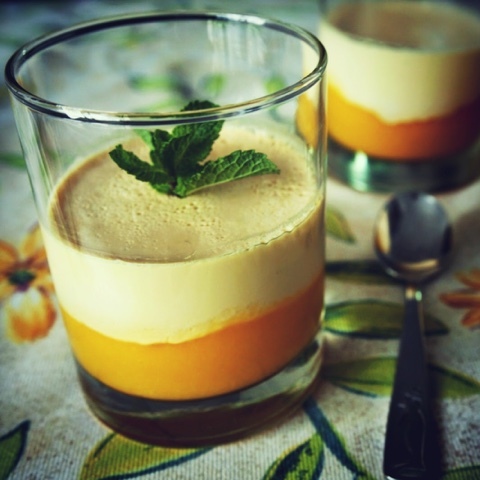 I stumbled upon many dessert recipes and this panna cotta become the champion because I love the unique taste of cardamom on milky dessert (and I happened to have some ripe mangoes :P ). I combined and modified few recipes to my taste (to my level of cooking ability more likely, which is pretty basic). To prepare the mango layer: purée the mango with a food processor until it becomes a soft purée. Next, put the purée into a pan on low heat, add sugar and cardamom. Continue cooking until the sugar is completely dissolve than turn of the heat and set aside to cool. In my case I put a generous amount rightaway on my serving glass as the basic layer and let it cool there. To prepare the vanilla layer: simply cook the flan mix according the written cooking direction shown on the flan's box (please note that some requires cream and milk, some only need water, if so, skip the cream and milk part from this recipe), and add sugar, vanilla essence and cardamom, cook until it boils. In my case, I add all the ingredients and cook it until it boils. Taste it from time to time, just to remind yourself how awesome your dessert will be. Pour the vanilla mixture on to the mango layer super gently (gentle as a tiptoe of a teen who came home well passed her curfew and tried her best not to get noticed by her parents kind of gentle). Pour it spoon by spoon if necessary, just so the vanilla layer doesn't penetrate the mango layer. Once you are done with your layers, put it in the fridge to cool. Decorate it with mint leaves before serving. PS: It is super important to use freshly ground cardamom in this recipe. Please do not use store bought cardamom powder, it does not have the same sweet smell to it. Trust me, I tried it once and I hated myself. Simply take few cardamom pods, take out the seeds inside and crush it with mortar pestle. Crush it well so it will not show as residue-like black stuff on your magnificent dessert.